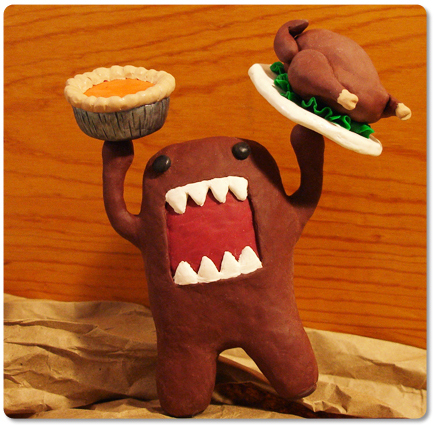 Out of all the holidays, Thanksgiving is probably Domo’s favorite because of all the delicious foods that are served. Unfortunately, it seems as though Domo is unwilling to share the huge bounty on the Thanksgiving table, and is making a mad dash taking along the entire turkey and a whole pumpkin pie! But little does he know that these two traditional Thanksgiving dishes are really sculpted out of polymer clay! The pumpkin pie tin is also sculpted from polymer clay with silver metallic pigment applied to it, and a coating of clear sealant to give it a bit of shine. The pumpkin filling also has a thin layer of sealant over the top. Whether it results from eating all that food, or from all that running while scurrying away with the turkey and pie, I’m sure Domo will be happy and napping just like everyone else after their Thanksgiving meal! 2 Responses to Happy Thanksgiving! How cute! These are so creative!